Coal needs to stay in the ground to stop climate change. But Germany is the world’s number one producer of lignite! Politicians and corporations are doing nothing, meaning phasing out coal is our own responsibility. In August, we will blockade power stations and cut them off from coal supplies. And when delegations meet in Bonn in November for the UN climate conference, we will return to the pit to show where the real climate negotiations are happening in Germany. 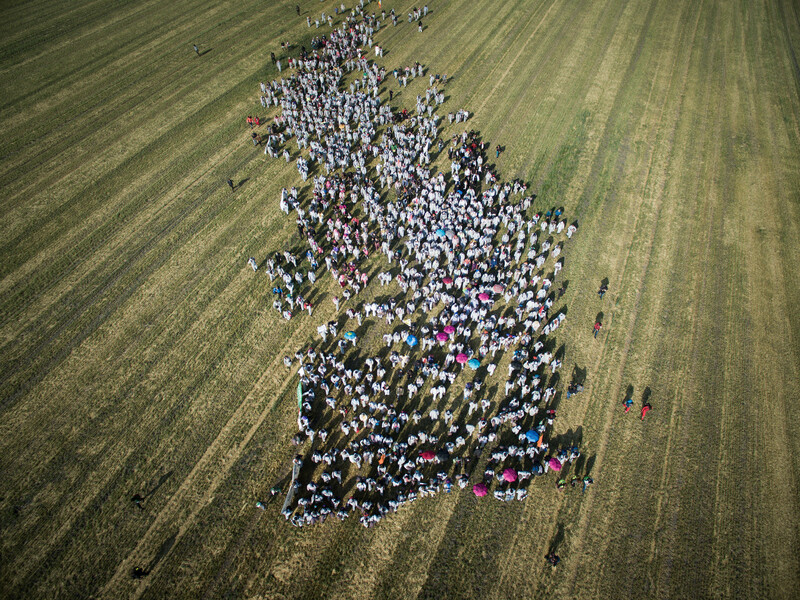 We say “Ende Gelände” (“Here and no further”)! The international climate negotiations on the implementation of the Paris climate agreement will take place in Bonn in autumn 2017 under the Presidency of Fiji. But Europa’s dirtiest CO2 emitter is right next door – the Rhineland coal mining area is full of lignite mines and power stations. Germany likes to present itself on the international stage as a model for transforming the energy system, but domestically, the coal phase-out is being delayed. Even though we know that to avoid the worst impacts of global temperature rises, coal must stay in the ground! Starting right now! In the Rhineland and Lausitz/Lusatia coal mining areas and in the coal mining area around Leipzig villages are being destroyed by the diggers, woodland deforested and people forced out of their homes. The profit of energy corporations is being put before the climate, culture and nature. The consequences of this policy failure are now being passed on to employees and the local population. The global consequences of climate change have become incalculable: Pacific island states – including Fiji – are threatened by rising sea levels and the frequency of hurricanes and droughts is increasing. The consequences of climate change are already destroying the livelihoods of many people in the Global South and worsening social, economic and political conditions in many countries. Climate change is thus one of many factors causing people to flee their homes. That isn’t something we’re willing to accept any longer – we want a just world where everyone’s life is worth living! We cannot seriously tackle climate change or provide global social justice without overcoming capitalism, its obsession with growth and its mechanisms of exploitation. As long as energy giants such as RWE, E.on, Vattenfall, EPH and EnBW continue to control the energy system they will use it to make themselves profits. We need a transformation of the energy system based on decentralisation and grassroots democracy in which people make their own decisions about usage and production. We need a thorough social and economic transformation so that everyone can lead a good life! We need to take action now to ensure the effective implementation of the 1.5 °C limit, pushed for especially hard by people in the Global South. We will now oppose the destruction in the lignite mining areas. We can’t wait for international climate conferences. 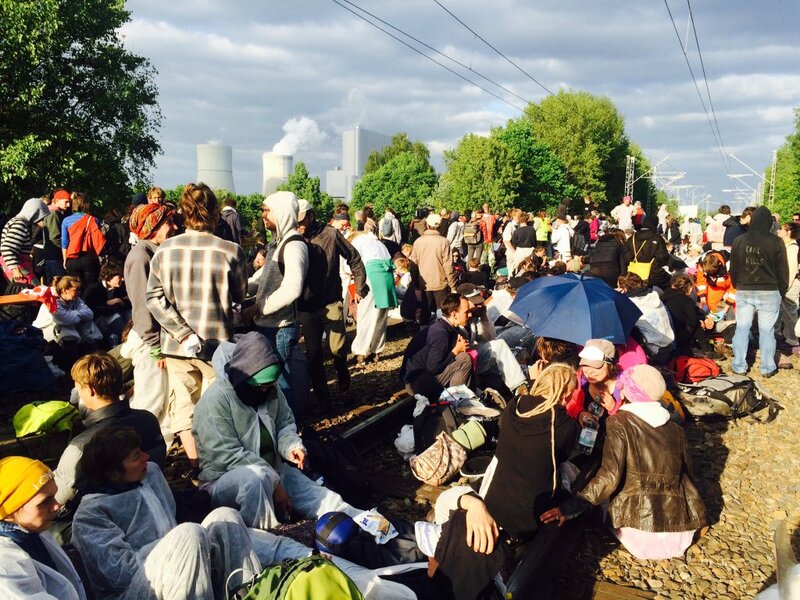 Global climate justice means an immediate end to coal in Germany! Our actions of civil disobedience may not be legal but they are definitely legitimate. We are announcing them openly because we are firmly convinced that our action is urgently necessary given the dangers posed by climate change. People around the world are fighting fossil-fuelled capitalism. They are blocking coal power stations in India, pipelines in the USA, coal ports in Australia, fracking in Brazil and oil drilling in Nigeria. Our actions in Germany over the last few years have also shown that we can achieve a lot when we are united and determined. In 2015, over a thousand people blocked Garzweiler mine in the Rhineland. In 2016, several thousand people from many different countries shut down the coal infrastructure. In 2017, we’re going to come back to the Rhineland and we’re going to be even more diverse! 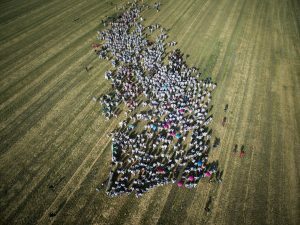 Lots of different players in the wider movement will take part in the action days from 24th to 29th August and show that the resistance to coal as an energy source takes many forms: there will be local initiatives, environmental organisations, small groups of anarchists and climate activists from all over Europe who will initiate an immediate start to the coal phase-out. 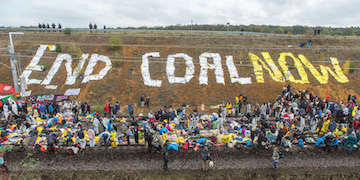 So, in August and November we’ll say: Ende Gelände (here and no further) to coal! Climate justice now! Get organised, be creative and come with us to the Rhineland.